Unlock the world's larder. Simply cooked. Source of fibre. Low saturated fat. Suitable for vegans.Freekeh (free-kuh) is a baby green wheat, which has been roasted to give it a distinctive, smoky flavour. 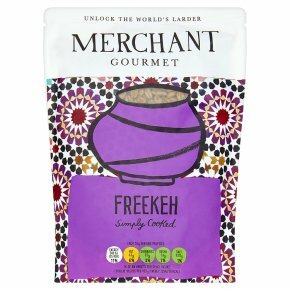 This freekeh has been simply cooked with water and olive oil - it's perfect for adding an extra dimension to your stir-fries and salads. Easy to prepare Squeeze the pouch to loosen the grains. For best results, heat through in a pan with a dash of water. Otherwise, tear a 2cm opening at the top and microwave for 45s at 900w, or simply enjoy it cold. Get creative For a colourful salad: roast chunks of skin-on butternut squash, until golden. Sprinkle with crumbled feta and pomegranate seeds, and stir in the warmed freekeh. Season and serve on a bed of rocket. To eat cold: Serve straight from pouch. Tear open by 1cm and heat using the guidelines below.Watts: 900, Time (secs) 40Watts: 750, Time (secs) 60*Watts: 500, Time (secs) 120Leave pouch for 30 seconds then shake well before opening away from yourself to avoid steam. Bring half a pan of water to the boil and place the pouch unopened into the boiling water. Simmer for 10 minutes, then tear open and serve.